Traditional and Roth IRAs are both important retirement planning tools available to everyone, regardless of whether they already participate in an employer-sponsored retirement plan like a 401(k) plan. They each provide some tax benefit on retirement savings invested in these types of accounts, but they do so differently, and enjoying their benefits often requires meeting certain requirements and criteria. For such retirement plans, Internal Revenue Service (IRS) rules dictate that you cannot keep your retirement funds your tax-advantaged retirement account indefinitely. In order to enforce this rule, the IRS requires that you take required minimum distributions (RMD) or suffer a steep penalty. Certain retirement plans, such as 401(k) plans and Traditional IRAs require individuals to begin to withdraw money from their account when they reach age 70.5. These required withdrawals are known as required minimum distributions or RMDs, and they dictate the minimum amount people must withdraw from their account every year beginning by age 70.5. The IRS is fairly strict on RMDs as they are included in the retiree's taxable income and, therefore, are subject to income taxes. This is the IRS' opportunity to collect some tax on money that had been deductible or tax-free up until this point. For those people who are using their retirement account money to live on in retirement, the RMD requirement is essentially irrelevant as many of them are likely already meeting this requirement. In fact, since RMDs are simply the required minimum, most people who are using their retirement savings for income actually withdraw more than the required amount, and they typically begin withdrawals before the age limit kicks in. But for those retirees who have other sources of retirement income or who might otherwise not spend the money in these types of retirement accounts, this requirement kicks in and essentially triggers taxable income. Consequently, they cannot continue to hold funds in these accounts indefinitely, and the opportunity for future tax-deferred growth is lost. While RMDs are a requirement for Traditional IRAs, 401(k) plans, SIMPLE IRAs, and SEP IRAs, RMDs are not a requirement for Roth IRAs. In most cases, you must take your first required minimum distribution for the year in which you turn age 70.5. However, your first distribution can be delayed until April 1 of the year following the year in which you turn 70.5. For all subsequent years, including the year in which you received the first RMD by April 1, you must take the RMD by December 31 of the year. If you don't take withdrawals, or you take less than you should, you'll end up getting hit with a 50 percent federal penalty tax on the difference between the amount you withdrew and the amount you should have withdrawn. And even with that bad news, you'll still have to withdraw the required amount and pay any income tax due on the taxable amount. The Internal Revenue Service provides required minimum distribution worksheets to assist with the process of calculating RMDs. Joint and Last Survivor Table (see Appendix B): Use if your spouse is 10 years younger than you. Single Life Expectancy Table: Use if you are taking distributions as a non-spouse beneficiary. A variety of helpful RMD calculators is also available to help you calculate required distributions. Roth IRAs, like other retirement savings vehicles, offer some great benefits from tax-free growth to investment flexibility, but another potential benefit of Roth IRAs is that they have no required minimum distributions and are not subject to the RMD rules. 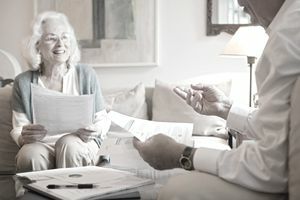 Even individuals older than 70.5 are not required to take any money from their plans, meaning that the tax-free growth offered by Roth IRAs can continue. For most retirees, this exception from RMD rules is inconsequential, as most people begin withdrawals from their Roth IRA upon retirement. But for those who may not need to withdraw funds from their Roth IRA for retirement living expense, a Roth IRA can provide an incredible opportunity to pass on a growing inheritance to heirs and loved ones. Though Roth IRAs do not have RMDs during the account owner's lifetime, withdrawals are required on inherited Roth IRA funds, but they follow slightly different rules from the RMD rules.